First ray insufficiency has been closely linked to metatarsalgia and less commonly discussed as a cause of digital deformities. Metatarsalgia is often thought to be the result of elongated metatarsals. 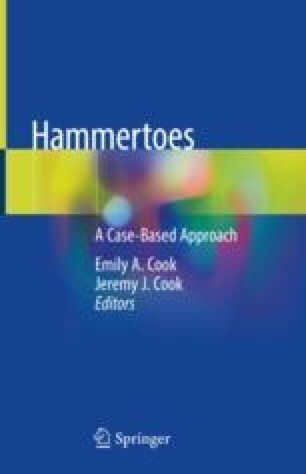 Increased pressure under an elongated metatarsal has been speculated to cause attrition and eventual rupture of the plantar plate of the lesser metatarsophalangeal joint (MTPJ), leading to hammertoe or crossover toe deformity. While the interconnection between first ray insufficiency, metatarsalgia, and digital deformity has been well accepted, scrutiny of the literature shows conflicting evidence of support. Hypermobility of the first ray using standard clinical measures has not been demonstrated in any condition other than hallux valgus. Hypermobility of the first ray has been recognized to be a result, rather than a cause, of hallux valgus deformity. Therefore, metatarsalgia can be a common complaint in hallux valgus patients. In the absence of hallux valgus, a plantarflexed metatarsal is a logical cause of metatarsalgia. Digital deformities can cause plantarflexed metatarsals. Instability of the first ray and metatarsalgia can result from rearfoot and midfoot dysfunction. Pronation of the rearfoot and unlocking of the calcaneal-cuboid joint will compromise the dynamic stabilization of the first ray contributed by the peroneus longus muscle as well as the plantar aponeurosis. Instability of the first ray in this circumstance will transmit center of pressure laterally during terminal stance, shifting from a high-gear to a low-gear toe off. Engaging a less-efficient windlass mechanism through the lesser MTPJs compromises overall stability of the medial longitudinal arch. Low-gear push-off also can cause overload of the lesser MTPs, increasing plantar pressure, increasing the risk of metatarsalgia, and development of digital deformity.